Work seamlessly with team members and customers. 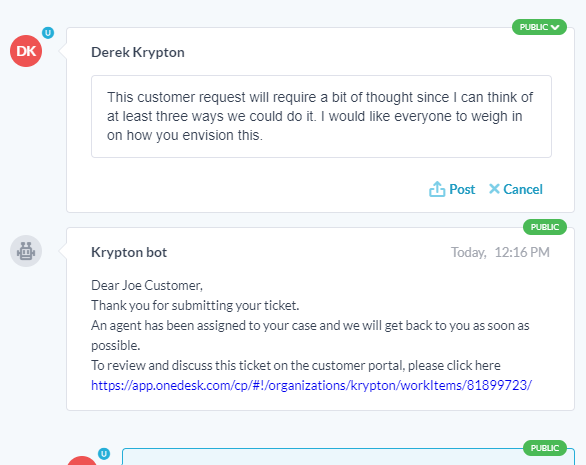 Using OneDesk means conversations with team members or customers are never more than a click away. At OneDesk we know that communication is often what makes or breaks a successful project or product launch. We’ve made it simple to collaborate with team-members, customers and other stakeholders. Ensure that everyone is always on the same page and make sure that you never have to worry about lost e-mails, tickets, or forgotten tasks ever again. Sharing a project with a user or team means that they can be assigned to, view, and discuss items within it. Following an item means you will receive notifications about any new discussions on it. Authors, assignees, and commenters will automatically follow the item. To invite members to a project, open the project menu on the top left of the page and click “Share” next to the project. You can add existing users, new users, customers, or external users to the project. To assign an item within the project, select the item and assign a member or team. (Note: customers cannot be assigned). You can discuss items (tasks, tickets, etc.) 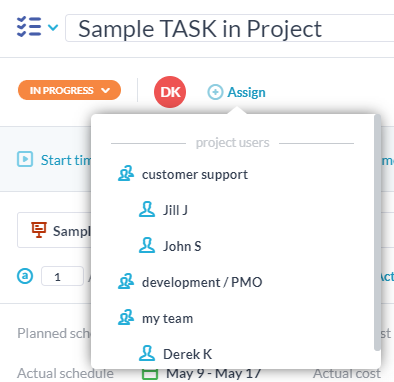 and projects with teammates and customers from the main OneDesk web app, from the mobile app, by email, or from the customer portal. Discussions are seamlessly captured and threaded as replies are received. You can even set up auto-responses to take care of standard replies. Share attachments with your team members directly on any item or project. Need to share a visual aid, document, design or screenshot? Attach it and everyone on the project has instant access.